For the basketball competition, see Balkan International Basketball League. Map showing the borders of the Balkan states before and after both Balkan Wars. The Balkan League[a] was an alliance formed by a series of bilateral treaties concluded in 1912 between the Balkan states of Greece, Bulgaria, Serbia and Montenegro, and directed against the Ottoman Empire, which at the time still controlled much of the Balkan peninsula. The Balkans had been in a state of turmoil since the early 1900s, with years of guerrilla warfare in Macedonia followed by the Young Turk Revolution and the protracted Bosnian Crisis. The outbreak of the Italo-Turkish War in 1911 had further weakened the Ottomans and emboldened the Balkan states. 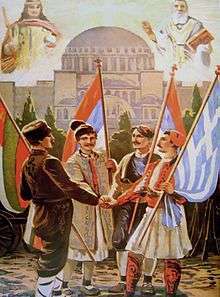 Under Russian influence, Serbia and Bulgaria settled their differences and signed an alliance, originally directed against Austria-Hungary on 13 March 1912, but by adding a secret chapter to it essentially redirected the alliance against the Ottoman Empire. Serbia then signed a mutual alliance with Montenegro, while Bulgaria did the same with Greece. The League was victorious in the First Balkan War which broke out in October 1912, where it successfully wrestled control of almost all European Ottoman territories. Following this victory however, the old differences between the allies re-emerged over the division of the spoils, particularly Macedonia, leading to the effective break-up of the League, and soon after, on 16 June 1913, Bulgaria attacked her erstwhile allies, beginning the Second Balkan War. After the Crimean War (1853–1856), Russia realized that the other Great Powers would spare no effort to prevent her from gaining access to the Mediterranean. As a consequence she started engineering an ambitious plan for indirect expansion through the creation of friendly and closely allied states under Russian patronage in the Balkan peninsula. Instrumental to this policy was the emerging Panslavic movement, which henceforth formed the basis of Russian foreign policy up until the end of the Tsarist regime in 1917. Working in this direction, following the victorious Russo-Turkish War of 1877–1878, Russia managed to establish an autonomous Bulgarian state. Similarly, after saving Serbia from annihilation at the Turks' hands in 1876, Russia forced the Ottomans to accept a full independent and expanded Serbia two years later. However, although both states acknowledged Russian patronage and protection, their conflicted national aspirations soon led to a series of hostile actions before and after the short war between them. With the antagonism of the European powers mounting, and smarting from her humiliation by the Austrians at the Bosnian crisis, Russia sought to gain the upper hand by creating a Russophile "Slavic block" in the Balkans, directed both against Austria-Hungary and the Ottomans. Consequently, Russian diplomacy began pressuring the two countries, Serbia and Bulgaria, to reach a compromise and form an alliance. Apart from the Russian pressure upon Bulgaria and Serbia, another issue that triggered the formation of the League was the Albanian Uprising of 1911. 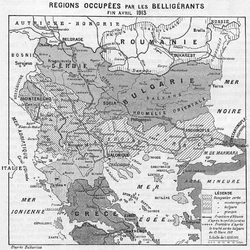 The timetable of the negotiations between Serbia and Bulgaria indicates that progress paralleled the success of the Albanian revolt. In May 1912 the Albanians succeeded in taking Skopje and continued towards Monastir, forcing the Ottomans to recognize the autonomy of Albania in June 1912. For Serbia this was considered catastrophic; after her hopes of expansion to the north were thwarted due to Austro-Hungarian annexation of Bosnia and Herzegovina in October 1908, Serbia now found the last direction of possible expansion, the south, also closing due to the creation of an Albanian Vilayet. The Serbs now had to struggle against time to avoid the establishment of the Albanian state. On the other hand, Bulgaria used this Serbian anxiety in order to force Serbia to agree to significant concessions in regard to Vardar Macedonia. Thus the final agreement between the two countries stipulated that, in the event of a victorious war against the Ottomans, Bulgaria would receive all of Macedonia south of the Kriva Palanka-Ohrid line. Serbia's expansion was to be to the north of this line, including Kosovo, and west to the Adriatic coast, a territory including the northern half of modern Albania, giving Serbia access to the sea. In essence, Serbia was forced to exchange Macedonia for Albania, an issue that would play a key role in the eventual dissolution of the League in the spring of 1913, when the Great Powers insisted upon the creation of the Albanian state and denied Serbia her territorial gains in that direction. Bulgaria, on her part, had held a long-term policy regarding the Ottomans since restoring her independence during the Russo-Turkish War. After the successful coup d'état for the incorporation of Eastern Rumelia, she had orchestrated a methodical scenario of indirect expansion through the creation, in the multi-ethnic Ottoman-held Macedonia (for many centuries an administrative rather than a nationistic name), of a united, liberating and revolutionary organization, the IMRO, allegedly without national color. IMRO's rhetoric claimed to be speaking generally for liberation on behalf of the “Macedonian People”, declaring its anti-chauvinism. In fact, it was a Bulgarian-backed organization created with the secret agenda of facilitating the incorporation of Thrace (Eastern and Western) and Macedonia (Aegean and the Vardar) into a new autonomous state, as an intermediate step before unification with Bulgaria could take place in the same way as with Eastern Rumelia. After initial success, Serbia and especially Greece realized the true purpose of IMRO and consequently a vicious guerrilla war, the so-called Macedonian Struggle broke out between Bulgarian and Greek backed armed groups within Ottoman Macedonia. The conflict ended only when the Young Turks movement came to power, promising reforms and equality of all Ottoman subjects regardless of religion or nationality. Bulgaria then turned to the more direct method of expansion through winning a war, building a large army for that purpose and started to see itself as the "Prussia of the Balkans". But even so, it was clear that Bulgaria could not win a war against the Ottomans alone, and an alliance was necessary. By signing the military appendix to the original agreement Bulgaria aimed to use the Serbian army to seize most of Macedonia while concentrating her own army for the operations against Thrace with its major cities of Adrianople and Constantinople. In Greece, army officers had revolted in August 1909 and secured the appointment of a progressive government under Eleftherios Venizelos, which they hoped would resolve the Cretan issue in Greece's favour and reverse their defeat of 1897 at the hands of the Ottomans. In the discussions that led Greece to join the League, Bulgaria refused to commit to any agreement on the distribution of territorial gains, unlike the deal with Serbia over Vardar Macedonia. The reason was Bulgaria's diplomatic policy of pushing Serbia into an agreement limiting her access to Macedonia, while at the same time refusing any such agreement with Greece. 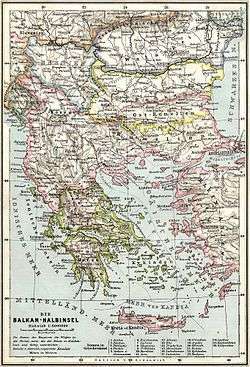 Having a low regard for the Greek Army's military effectiveness, the Bulgarian leadership estimated that, according to the military plans, their limited forces that had been deployed to the Macedonian theatre would be able to occupy the larger part of the region and the important port city of Thessaloniki before the Greeks. The entry of Greece in the League however was essential for the allies, since Greece, alone among the Balkan states in possessing a major fleet, could preclude the mass transfer of Ottoman reinforcements from Asia directly into Europe by sea. As the Greek ambassador to Sofia had put it during the negotiations that led to Greece's entry in the League: "Greece can provide 600,000 men for the war effort. 200,000 men in the field, and the fleet will be able to stop 400,000 men being landed by Turkey between Salonika and Gallipoli." Montenegro, a relatively small country but a close ally of Serbia was considered a second class participant. It took the invitation to the insistence of Serbia more as a favour, having limited local aspirations over the Sanjak and the north Albanian city of Shkodra. Russia was a prime mover in the establishment of the League and saw it as an essential tool in case of a future war against her rival, the Austro-Hungarian Empire. But she was unaware of the Bulgarian plans over Thrace and Constantinople, territories on which she had long-held ambitions, and on which she had just secured a secret agreement of expansion from her allies France and Britain, as a reward in participating in the upcoming World War I against the Central Powers. Germany, already heavily involved in the internal Ottoman politics, officially opposed a war against the Empire, but in her effort to win Bulgaria for the Central Powers, and seeing the inevitability of Ottoman disintegration, was playing with the idea to replace the Balkan positions of the Ottomans with a friendly Greater Bulgaria in her San Stefano borders, an idea that was based on the German origin of the Bulgarian King and his anti-Russian sentiments. 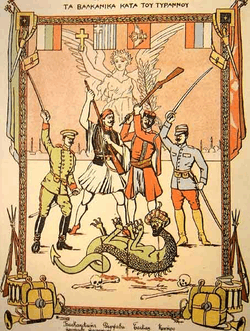 Poster of the Balkan League during the Balkan Wars reading: "The Balkan (States) against the tyrant"
In the resulting war, the combined Balkan armies effectively destroyed Ottoman power in Europe in a series of victories. However, the League's triumph was short-lived. The antagonisms between the Balkan states still persisted, and after the successful conclusion of the First Balkan War, they resurfaced, especially over the partition of Macedonia. Mounting tensions effectively tore the League apart, and the Second Balkan War broke out when Bulgaria, confident of a quick victory, attacked her former allies Serbia and Greece. The Serbian and Greek armies repulsed the Bulgarian offensive and counterattacked penetrating into Bulgaria. The Ottoman Empire and Romania took advantage of the situation and invaded Bulgaria too. The subsequent peace left Bulgaria with gains in territory, but led to the loss of Eastern Thrace to the Ottomans and most of Macedonia to the Greeks. Defeat turned Bulgaria into her participation in the First World War on the side of the Central Powers, since her Balkan enemies (Serbia, Greece and Romania) were involved in the war on the side of the Entente. During the war, the Greek king was assassinated in Thessaloniki under yet unresolved conditions. That generated a shift in the Greek foreign policy from clearly pro-Entente to neutrality, since the new King, unlike his father and his popular Prime Minister, was pro-German and tried to keep the country neutral in the upcoming World War. With the outbreak of World War I and the Entente's intervention in Macedonia, the conflict between king and first minister steadily deteriorated, leading eventually to the National Schism, that greatly contributed to the loss of the next war against Kemalist Turkey in Asia Minor, and dominated Greek politics for over a half of a century. The outcome of the Balkan Wars caused a permanent break-up of the Russo-Bulgarian alliance, and left Serbia and Montenegro as the only allies of Russia in this critical region. ↑ "Wars of the World; First Balkan War 1912-1913". OnWar.com. December 16, 2000. Retrieved 2009-08-14. ↑ Crampton (1987) Crampton, Richard (1987). A short history of modern Bulgaria. Cambridge University Press. p. 62. ISBN 978-0-521-27323-7. ↑ "Balkan Crises". cnparm.home.texas.net/Wars/BalkanCrises. August 14, 2009. Retrieved 2009-08-14. ↑ Tuminez, Astrid S. (2000). Russian nationalism since 1856: ideology and the making of foreign policy. Rowman & Littlefield Publishers, Inc. p. 89. ISBN 978-0-8476-8884-5. ↑ Frucht, Richard C. (2005). Eastern Europe: An Introduction to the People, Lands, and Culture. ABC-CLIO. pp. 538–9. ISBN 978-1-57607-801-3. ↑ Stowell, Ellery Cory (2009). The Diplomacy Of The War Of 1914: The Beginnings Of The War (1915). Kessinger Publishing, LLC. p. 94. ISBN 978-1-104-48758-4.